Children are as prone to feeling stress and the pressures of their day-to-day just as much as adults, with the demands of school achievement, the complexities of making and keeping friends, the worries of starting at new schools – we may dismiss them now with time, but we’ve all felt them at some stage in our lives. Here you'll find our top apps for anxiety for children, children's anxiety books and tools recommended by experts to help your child cope with their worries. Our number one anxiety-relief tool is Yogiamo's weekly newsletter for stress relief tips along with a featured yoga pose to maintain balance and mindfulness. Simply enter your email address here. With yoga now seemingly a staple of a world trying to lessen stress, why not extend the knowledge to children who want to join in? Kids Yoga Deck helps children break down these stresses, as teaching yoga can include breathing exercises, coping techniques, and leave students more focused for the days and weeks ahead. The results are visible, so loosen up and give it a try! Smiling Mind is a not-for-profit organisation that dedicates itself to spreading mindfulness to everybody who needs it. Their vision is to “help every mind thrive”, and they aim this at people both in the classroom and in the workplace. One particularly useful tool to this end is their free app! The Smiling Mind app offers guided meditation and tonnes of modules for people in all stages of their life, from early school days to adult life. The app has been developed by psychologists and experts in education to help make it as relevant and meaningful as possible. Again, it’s free, so download it today and see what benefits it brings you and your child! Positive Penguins is an app that teaches children when to recognise negative thinking and helps them reframe it into something more positive. Challenging negative thoughts is the basis of popular therapy techniques such as cognitive behavioural therapy. 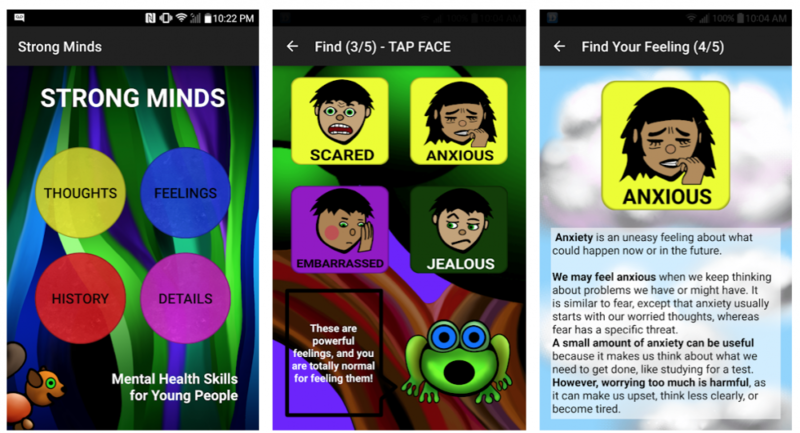 With the help of this app, kids learn that stress and negative feelings come from within, and are made up in our own heads. Positive Penguins is based on research into the cognitive habits that the majority of us form in our daily lives and how optimism can help us to better psychological health and wellbeing. If your child struggles with stress and anxiety that tends to spiral and worsen, this is a must-have app. Super Stretch Yoga teaches kids a variety of useful yoga poses through the use of animated, colourful characters! There are twelve poses to choose from, with a whole cast of characters to guide kids as they learn and copy. Check our recommended yoga mats, yoga clothes, and yoga essentials. Not only does yoga promote healthiness and physical wellbeing, it can also help to tame the symptoms of conditions such as ADHD by teaching children to be more focused and in control of themselves. Parents can learn right alongside and practice the poses at the same time, so why not unwind together and make some quality bonding time? 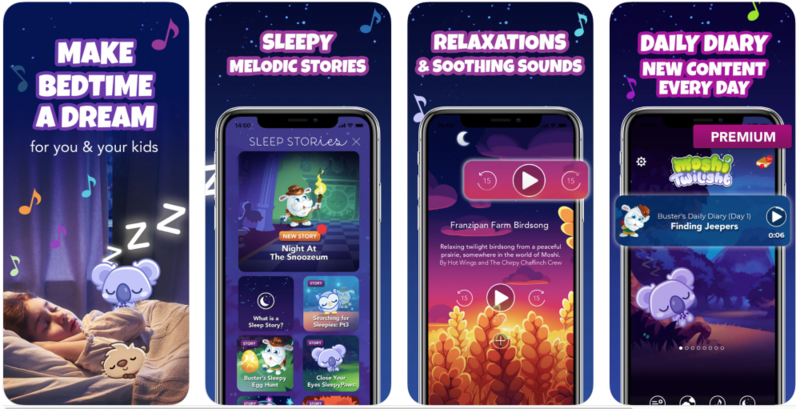 Relax Melodies is the product of app developers Ipnos, and it has over 30 million users benefiting from its sleep-enhancing results. Ipnos strive to create innovative apps that focus on relaxation and aid users in meditation. Relax Melodies is available in 10 languages and has over 100 ambient sounds. The way it works is by guiding meditation to create a relaxing bedtime routine that will soothe you into a satisfying, deeper sleep. Lots of young children can struggle when it comes to settling down for sleep and can often wake in the night. This can be distressing to deal with for parents and often takes a lot of patience, but experts recommend a consistent bedtime routine involving calming activities before sleep. Relax Melodies can help with this, and maybe you can even meditate together! This free app contains a number of children’s bedtime stories by a collection of best-selling authors including Glenn Harrold, Christiane Kerr, Heather Bestel and Jan Yoxall. It includes three bedtime meditations for free, with plenty more available as in-app purchases. The guided meditations suit a range of ages and help with restful, fulfilling sleep that will help the child or young person enjoy greater focus, concentration, creativity and a slew of other benefits. 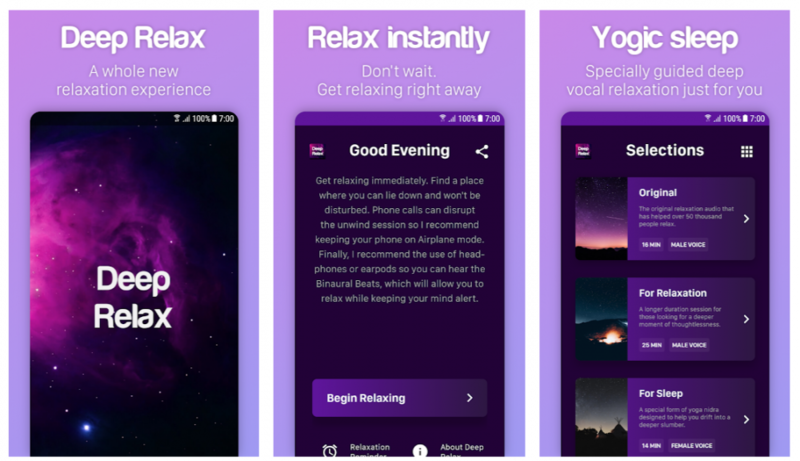 Each entry to the app has subtle sounds and music to help build a relaxing, calming atmosphere and lull the user into serenity. Since you can start off for free, it’s definitely worth a quick download and try before you buy! TanZen is a game made by developer Little White Bear Studios, comprising of tangram puzzles designed to be relaxing and engrossing. The app includes over 550 individual puzzles, and only costs $0.99! There is also a free version with around 50 puzzles to choose from. Relaxing games such as TanZen are ideal for an activity to wind down before bed, equal to reading a book, and they put your mind to ease. There is always the free version if you’re not keen on the idea of spending money on it just yet, so grab the free download and see what a few puzzles before bed does for your relaxation! Mekorama is an awesome game where you help a small robot find his way home! The game’s art style presents the levels like tiny mechanical dioramas, with a thoroughly charming aesthetic that draws you in instantly. There are 50 levels to explore in the game with thousands of fan-made levels as well. You can even make your own! The gameplay is relaxing and soothing and it utterly drips with charm, making it an ideal little game to play before bed or when your child needs a distraction from stresses. Best of all, the game is completely free to download! Try for as long as you like and pay whatever you think it’s worth! 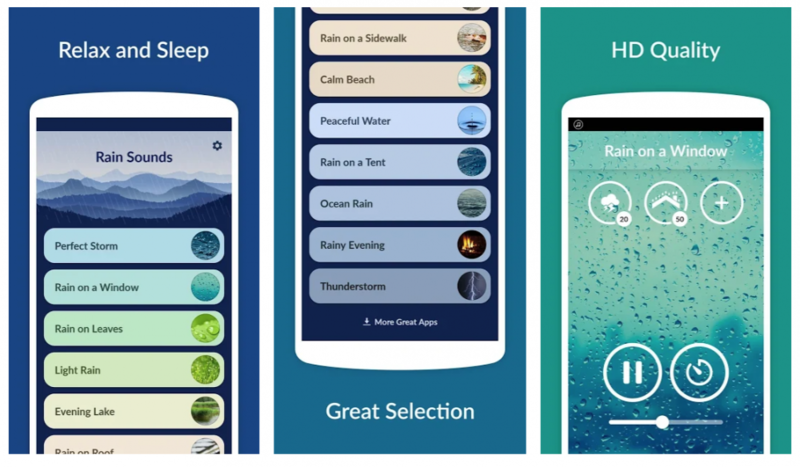 Just one of the apps developed by Relaxio, Rain Sounds is exactly what it appears! It comprises a collection of different rain sounds designed to be played continuously and softly in the background to soothe and relax. The sound of rain is a relaxing experience for many people, with several websites existing to play the sounds of rainfall behind music or in the background. 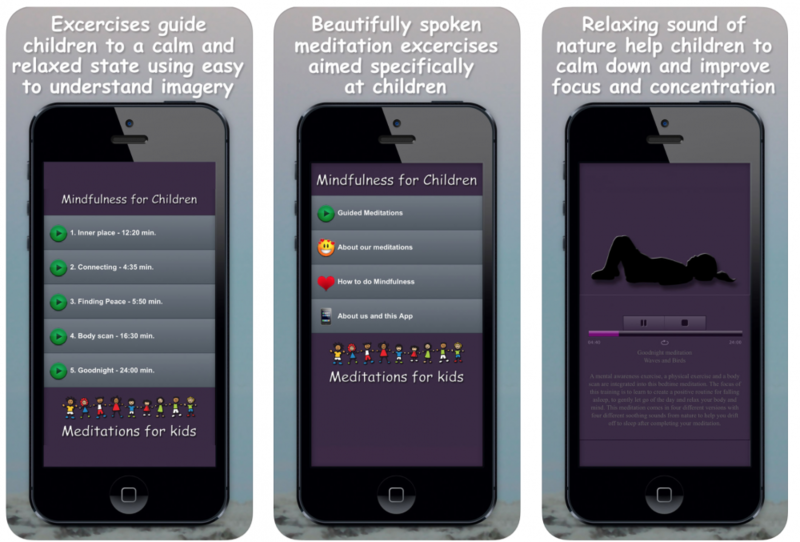 Relaxio also have apps for nature sounds, meditation music, gentle lullabies and more! 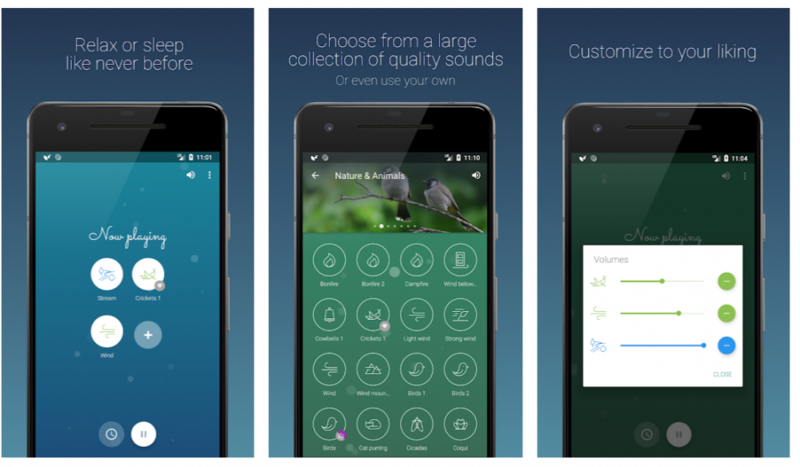 If your kids need some relaxing white noise to help carry them off to sleep or to distract them from the stressful sounds of civilisation, this app is ideal, maybe even with a pair of earphones to help drown out the outside world for a while! The Monument Valley games have won a slew of awards across both of their entries, and it’s easy to see why! The first Monument Valley was Apple Game of the Year 2014, and the second game presents a brand-new adventure in a stunningly beautiful setting. In the game, the player must help Ro teach her child about the mysteries of the valley, exploring gorgeous environments and manipulating the game world to progress. The games stand separate from each other and there’s no need to play the first in order to understand and enjoy the second. The colourful, artistic game world with the beautiful music is a fantastic way to unwind when you’re facing a stressful day, and this is the perfect addition to your arsenal of relaxing games for your kids! Find out more and see what you think! Moreno Maio has been making apps and games since discovering Unity 3D. They managed to grab an Apple license in 2017, so all of their works are available for free download both on Google Play and the App Store. Moreno’s works include Antistress, an app that gives a selection of relaxation toys to fiddle with such as a Newton’s cradle, wind chimes, lotus pond, and more! In fact, there are 34 different toys to play with! Each one has a satisfying interactive element to help you unwind and give you a convenient way to destress for free! Deep Relax is the work of Advait Saravade, a second year engineering undergrad studying at the University of British Colombia. The app harnesses the power of Yoga Nidra, meaning yogic sleep, to help you drift off quickly and effortlessly. Advait on the ethos of the app: “Whether you work as a doctor, teacher, lawyer, student or as any other profession, your work lifestyle can be stressful. The way you deal with it is essential to maintaining a healthy and balanced life. The idea for Deep Relax came from the question - "Which is the best way to actually deal with stress?" When you finish a stressful day at work, join your child let the app guide you to deep relaxation! 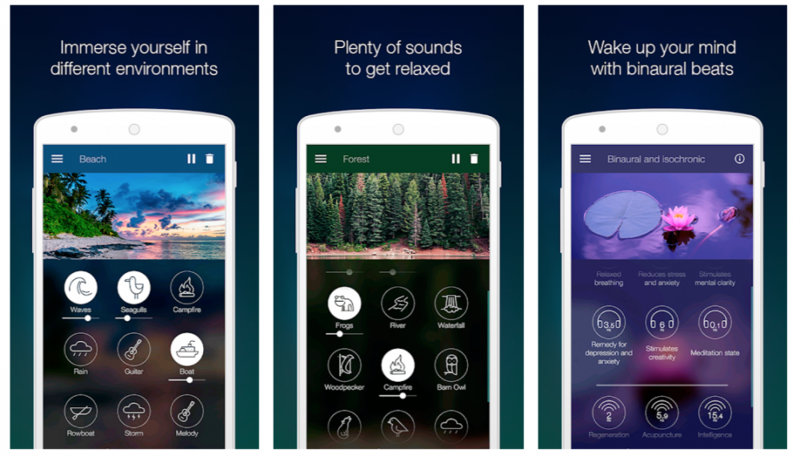 Atmosphere is a wonderful relaxing sounds app, based on different environments. Choose your favourites and combine them to create your perfect backing track to unwind! Getting out into nature and away from urban noise is a great break for kids, but we don’t all have the capability – be it lack of transport, time, money or anything else, getting to take a break away from it all isn’t always feasible. With an app like Atmosphere, kids can still drown out the noise of the world outside and just feel like they have some time to be on their own and relax for a while, which can make all the difference in the world during a stressful exam week! Audiojoy is a website and app company with tonnes of content available, with over 10,000 hours of self-help content. The platform has over 100 unique topics from publishers all around the world, covering all kinds of subjects including fitness and relaxation, health and wellness, personal development, lifestyle, and much more! Nature Sounds has over 10 hours of sounds from nature including wind, ocean, rain, water, thunderstorms and much more. You can even use the built-in timer to build a daily practice and allow your child to master the art of meditation! Orbia is a timing-based game that tests your ability to overcome moving obstacles in a colourful world with a beautiful art style. There are hundreds of levels across vibrant worlds, and each character has a bunch of unique skins to collect! 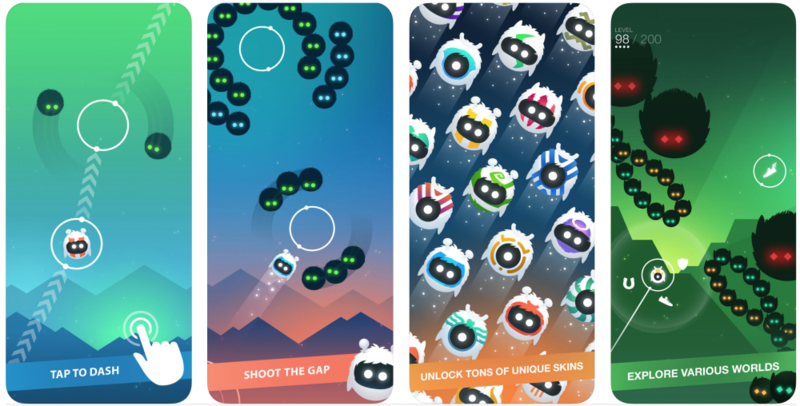 The game is backed by wonderful music and satisfying sounds, and is the perfect way to settle down into a cosy nook and relax with a minimalistic game that distracts you. Perfect for kids thanks to its simple gameplay and the ability to compete against friends! Being able to play with others is a great distraction from stresses in the day, so this one is definitely worth a download. Moshi Twilight is modelled after the characters of the popular Moshi Monsters franchise and is packed with stories that lull children to sleep with soothing audio and calming narration to help create a peaceful atmosphere. The app is free and has the backing of expert advice, such as sleep expert and psychologist Dr. Nerina Ramlakhan and sleep specialist Kate Bridle of Sleep HQ. The app is certified kid safe and completely safe to leave with your kids if they need privacy to really drift off to sleep, so if your young ones struggle to settle at night, give Moshi Twilight a go and see what the praise is about! Mindfulness for Children teaches mindfulness meditation that helps develop a sense of well-being, peace, and focus in their daily lives. Through breathing exercises and visualisations, children are guided in the process and eventually will know the process enough to conduct it themselves unaided. The app was created in Denmark by psychomotor therapist Pia Holgerson, as many schools in Denmark use meditations with a great rate of success in promoting mindfulness in children. Mindfulness training has been shown to suppress the symptoms of ADHD in some children, and it is perfect for teaching them to focus on their feelings and improve their mental wellbeing. Fear Tools comprises features that act as metrics and solutions to anxiety and stress, such as a questionnaire to track the severity of symptoms over time and a thought diary to elaborate on mental processes and help reframe them. There is also a paced breathing tool to provide a focus for self-calming, for when things get overwhelming and the user needs a physical action to guide breathing and calm down. This app is the perfect tool for children who are prone to panic and quick-mounting stress, and the thought diary is ideal for parents to revisit and read along with their child to reflect back and discuss. Relax Sounds has a healthy library of relaxing noises such as rain, storms, distant thunder, waves, coffee shop ambiance and much more! You can also add your own sounds and music to the app to add to its already-vast library and expand its potential even further. If your kids have a favourite song or sound, you can combine it with others in the app and make it perfect for their own unique relaxation. There’s also a timer to make the audio fade out after a certain amount of time, ideal to ensure that it quietens down once the user falls asleep. Coloring Book for Me by Apalon Apps is a great little stress reliever to have in your pocket to take anywhere! The ‘book’ is filled with intricate and detailed designs, such as patterns, animals, places, flowers, and much more! You can even transform photos from your device into sketches for you to colour and draw over! Use the textures of pencils, crayons and paintbrushes to colour, all with no mess and no set up, anywhere you like. Perfect for kids who need a colourful, interactive distraction to counter stress and overcome difficult emotions. HappiMe is a non-profit, free app for children and young people that aims to raise self-esteem and happiness. It teaches the power of positive thinking and how to frame your thoughts in a more helpful and productive manner. It’s also free for children and young ones! The app is informed by expert opinion and addresses the stages of learning how to identify and overcome your own negative thoughts. Experts say that most of our self-beliefs are formed by the time we are around the ages of 6 and 7 years old! Using techniques rooted in cognitive behavioural therapy and mindfulness techniques, it teaches children to discard thoughts that only serve to bring them down and instead choose to listen to the good thoughts! Giving kids the knowledge to recognise negative thoughts and remove them is a powerful thing indeed, so take a look at the app! Kids World is the perfect companion to the other apps on this list, and is a fantastic idea for parents of young children who want to share their smart device but want to establish the right attitude for playing in moderation and not getting addicted. Kids World has features such as a timer that closes the chosen app after a certain amount of time elapses, making it easier to persuade your child to hand the phone back. It also blocks ads and in-app purchases, and stops the child being able to exit the app in order to protect your data. This app is ideal for protecting your child while they use your phone, for example, if you’re driving or unable to supervise them for a short amount of time. Strong Minds is an interesting app that helps kids to find their feelings. It helps them narrow down to any of 35 feelings or emotions, and they are shown a facial expression and definition. They are then given prompts to think about, and are then allowed to write about that feeling. This app is ideal for children who deal with stress and anxiety but are unable to accurately or reliably portray how they truly feel. Guiding them in this way may help parents understand how their children really feel emotions and how to progress and overcome the negative ones. If your child is still struggling with how to describe their feelings, this app is absolutely ideal to guide them and learn some confidence! Here we have perhaps the most recognisable name in kids’ entertainment and learning. There are five scenarios for kids to make their way through, and while they may breeze through them fairly quickly, each one is replayable and is still worthy of revisiting. The app also features a parent’s section, which has free resources that parents will surely want to browse including helpful tips and videos to watch with your child to help them de-stress. You can also personalise the audio messages played to the child and they can be changed between English and Spanish. Finally, the app is completely free, so why not make it a quick download and take a look around? Breath of Light is the work of Many Monkeys studio, and every facet of the game is designed to be a relaxing, soothing experience from start to finish. In Breath of Light, the player connects white lotuses by transferring living energy to join them together. This is guided by rearranging mystical stones in an ethereal zen garden setting that draws the player in and doesn’t urge them to act quickly or keep score. The game is pure relaxation and meditation. The soundtrack is designed with the same ethos and is even available to listen to on its own! For something simple for your kid that won’t make them feel incapable or like they can ‘lose’, look no further than Breath of Light! My Oasis is the work of Korean developers Buff Studio, and they describe it as a game ‘created for people who need a break from life’. My Oasis contains no content designed to stress the player, giving you an oasis in a zen environment and calming atmosphere. The oasis gradually expands and grows as the player interacts with the surrounding life. It’s an idle clicker game, meaning it progresses without the need for constant player input. Use certain musical chords to change the weather and alter your oasis as you see fit! My Oasis is designed to relieve stress and put the player in a serene state of mind – just the thing to have in your pocket for when life gets too stressful! Chill Outz aims to develop creative and engaging apps for kids that help them with progressive relaxation and mindfulness to overcome fears and challenges as they grow. Mindfulness is the state of being able to live in the moment, forgetting future worries and the ‘background noise’ of life to just focus on present sensation and thoughts. In a sense, it’s being grateful for where you are and what you have. With the backing of Jacqueline and Kai Vorpahl – clinical psychologist and software product management expert, respectively – the apps have plenty of professional experience to inform and shape them, so give them a try! Wemberly is a creation of author and illustrator Kevin Henkes, who has been creating children’s books for thirty years. 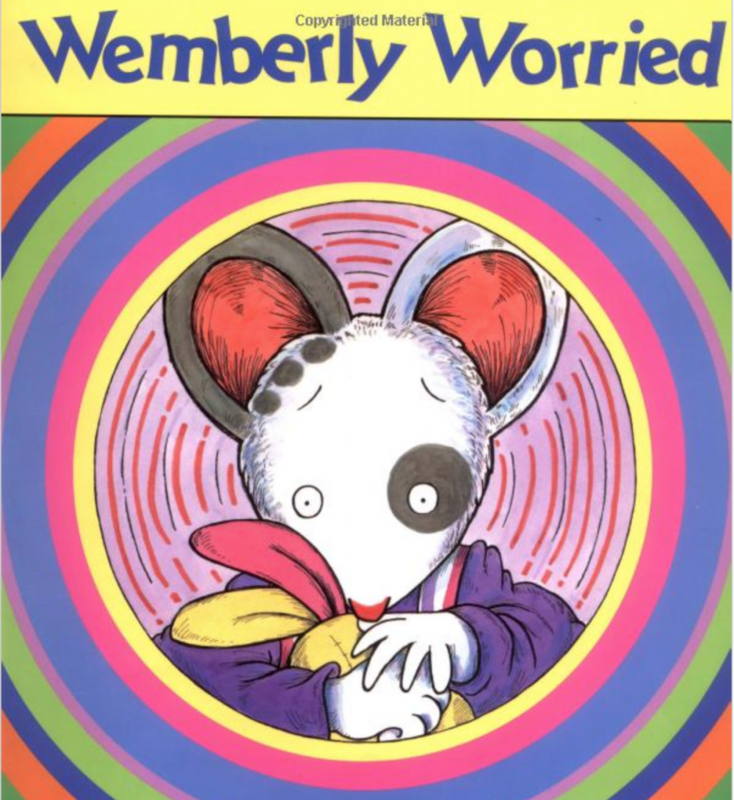 Wemberly the mouse first features in ‘Wemberly Worried’, a story about her worrisome ways and how these lead her to feel on her first day of school. The story is aimed at children who struggle with stress and worry, and the site has an accompanying activity guide! We all resonate with characters that we feel we can relate to, and children are no different when it comes to stories. Wemberly’s struggles with anxiety can help your child understand that their feelings are normal and controllable. Take a look at her tales and consider them for your worrisome child! 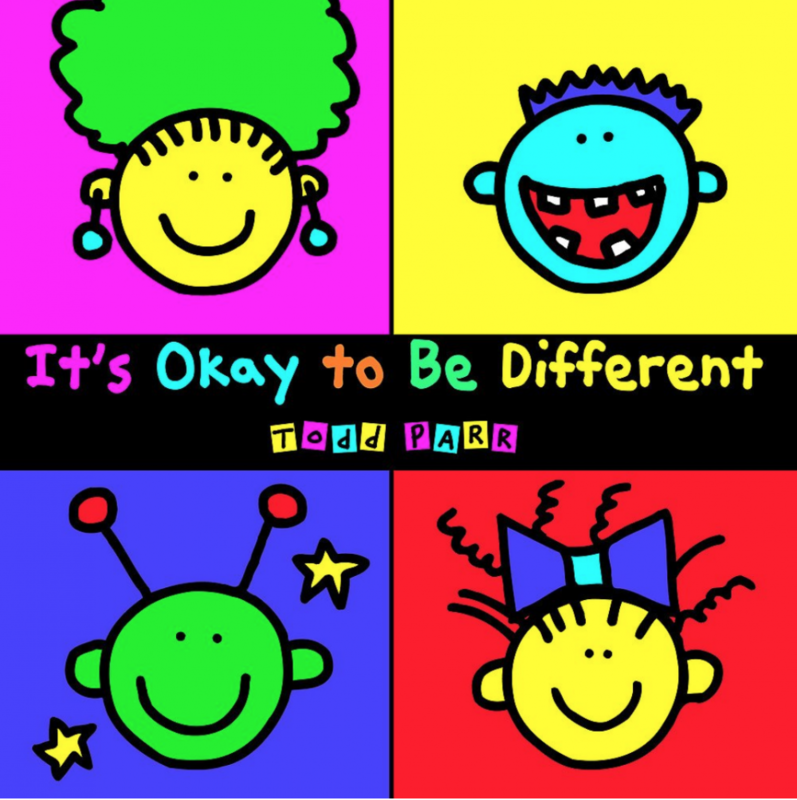 Written by kids’ author Todd Parr, It’s Okay to be Different teaches children that diversity is good in a simple, colourful, and witty manner. The book deals with potentially sensitive and difficult feelings such as adoption or ‘having a different nose’, to more light-hearted topics such as eating macaroni cheese in the bathtub! The book strikes a great balance between colourful silliness while tackling very real fears that a kid can face when going through the demanding process of settling into school and getting to know their numerous peers. For a straightforward yet engaging way to help children understand their fears and come to terms with them in an entertaining way, Todd Parr’s book is not one to miss. Subtitled ’50 Ways to Ride the Wave’, Anxiety Solutions for Kids is a set of cards that are based on solutions used by consulting psychologist Selina Byrne M.A.P.S., helping children with anxiety to build their resistance and wellbeing. The solutions are designed to stop worry becoming an unwelcome habit in kids’ lives, keeping things simple and easy to follow for when anxiety overrides everything else in a child’s mind. The cards each feature short, concise instructions to try when things get too much, and the ones that are most enjoyable or effective can become a go-to favourite. The solutions proposed on the cards by Selina are the result of years of experience, so consider them as a worthy addition to your stress-fighting arsenal! 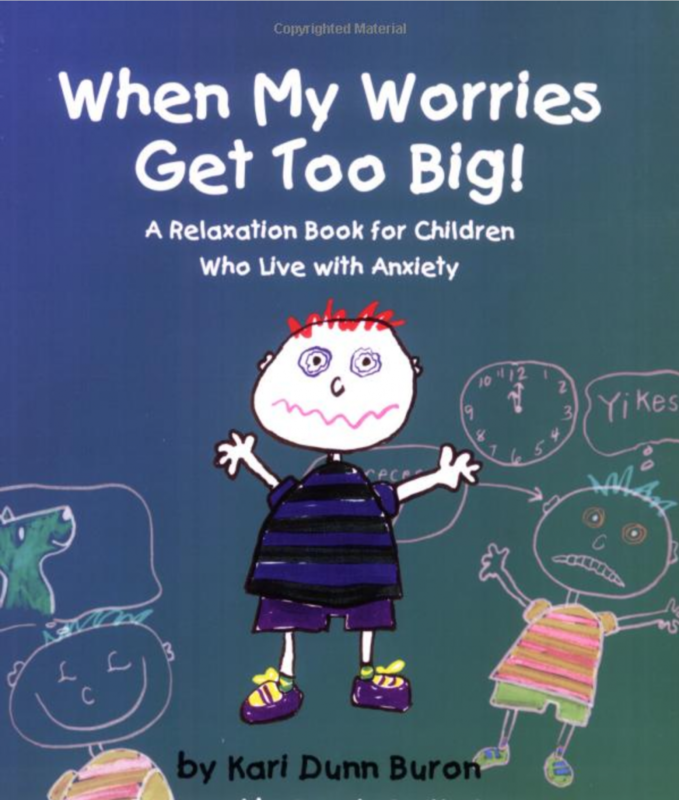 When My Worries Get Too Big is a book for children who struggle with anxiety and suffer a loss of control in their lives because of it. 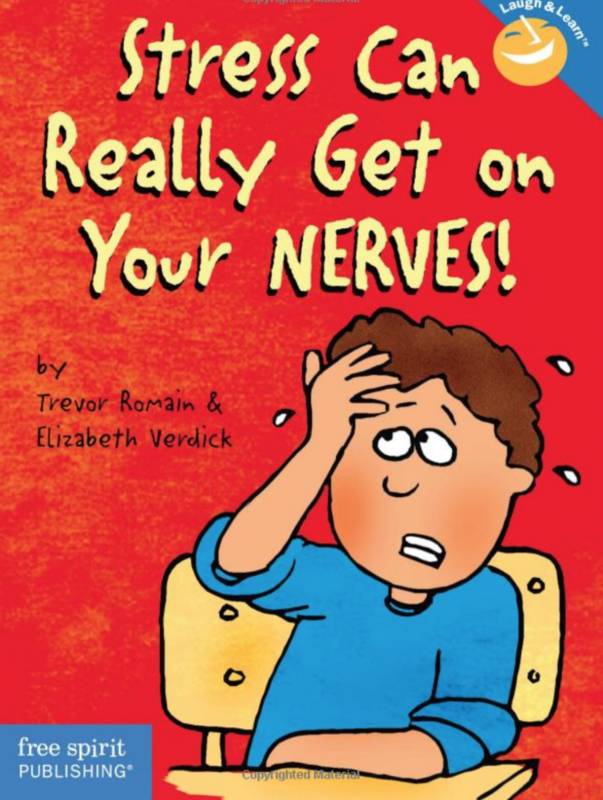 The book serves as a relaxation guide for kids who struggle with burdensome worries, and the goal is to instill self-relaxation techniques into the child’s memory so that they are empowered to face the stress on their own as they grow. Helping your children cope with stress and anxiety is important, but equipping them with the means to help themselves is a fantastic way to grant them some control and help them overcome their burdens. 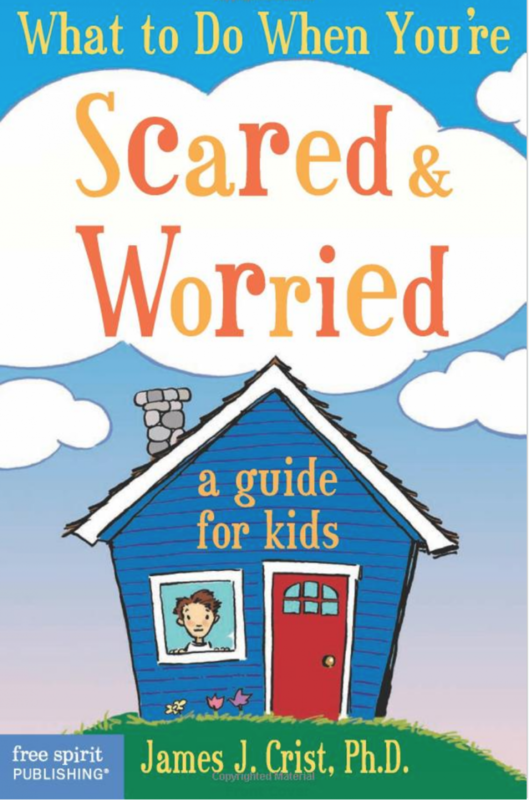 Just one of the many books by clinical psychologist James J. Crist, What to Do When You’re Scared and Worried is a self-help guide for children that explains why people have fears and how best to cope with them. James’ books are fantastic for kids, but he also has talks and podcasts on his website that deal with the subjects of stress, anxiety, making friends, and many more issues that kids may face as they grow up. They can be downloaded or listened to online, so take a look! Trevor Romain is an illustrator and award-winning author, who has travelled all over the world and delivered his stand-up with his inspirational self-help signature. Trevor is also a motivational speaker, and created his own company in 2007 that aims to help kids with their mental health in all aspects so that they can grow into happy and confident individuals. His reputation has built up to make him into a sought-after speaker! He has undertaken numerous projects and his books are highly acclaimed. Browse his works and find out what all the buzz is about! 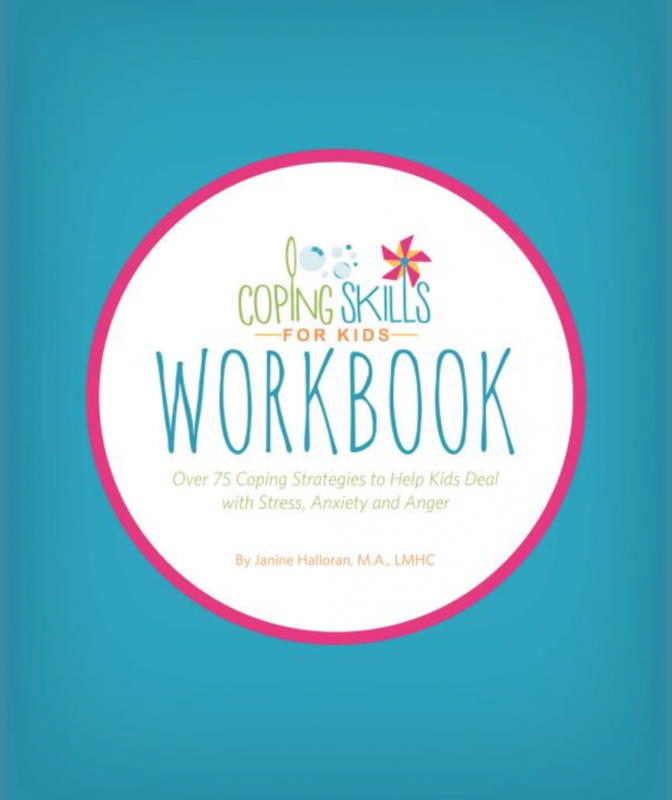 The Coping Skills Workbook is created to give kids a way to learn and practice coping skills. Equipped with these skills, young people can face their own anxiety, stress, and anger. The book is available either in print or as an ebook, and contains over 20 printable worksheets and more than 70 coping skills to try. It’s simple enough for kids to read and understand on their own, but working alongside a parent or family member is even better! The workbook has earned the praise of experts in child psychology, and has a lot to share for families who struggle with an anxious child! 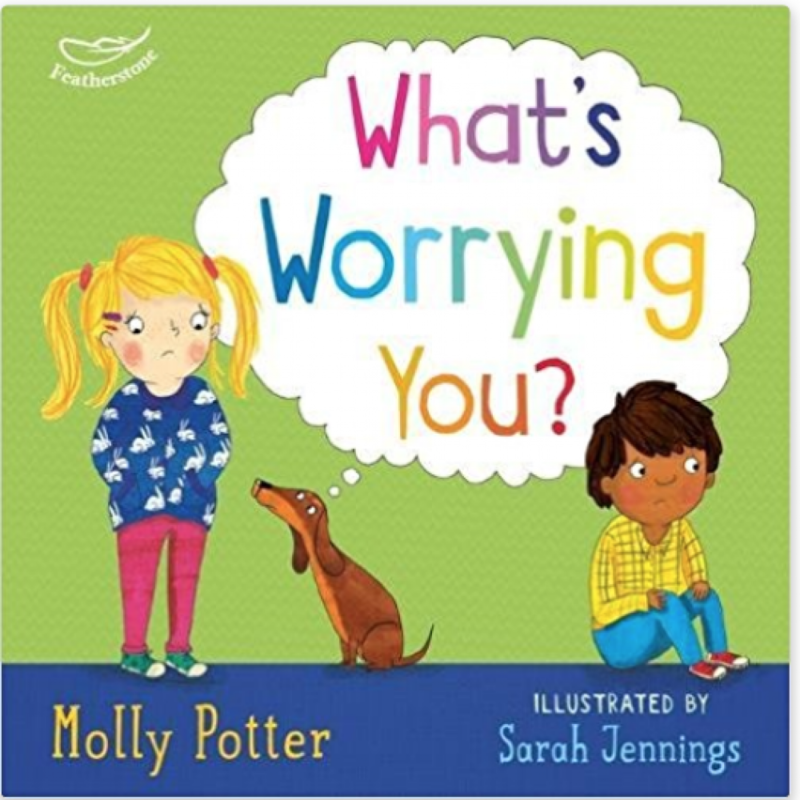 What’s Worrying You is a book for young children written by Molly Potter, an experienced speaker and trainer in the areas of health and wellbeing, behaviour management, team building, and emotional literacy. She has written more than 25 books and has a wealth of experience in the study of personality profiling, as well as being a qualified teacher with 14 years of experience behind her! Put simply, Molly knows a heck of a lot about how to deal with stress and anxiety! What’s Worrying You is just one of her books built on her amazing track record and contains all kinds of ideas for coping with overwhelming feelings, all accompanied by colourful and lively illustrations. It’s hugely affordable too, so why not put down the price of a cup of coffee for such a useful resource?